It was spring break of Phil Jacobs’ senior year at Denison University, a small school in Granville, Ohio. So Jacobs did what college-age kids have been doing since Dionysus tended bar in ancient Greece. He went South. Not for beaches and booze. Instead, Jacobs and his new bride Jenny pointed their old Buick Opel toward Atlanta, where they hoped to find their future. Jacobs, an English major, had a sports show on the college radio station and did play-by-play for the Denison football team. He wanted a job in sports marketing or broadcasting, so he made the rounds to some of Atlanta’s professional teams. He also applied at Southern Bell, which was developing its sales and marketing program. That’s who offered him a job. 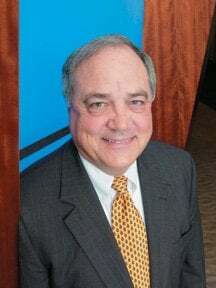 “It was a career pick in the dark, one that I was extremely fortunate to make,” says Jacobs, president of Georgia operations for BellSouth, and Georgia Trend’s Most Respected CEO for 2005. In some ways, Jacobs’ story is classic corporate Americana, the guy who climbs to the top from a low rung. He’s the guy who started on the ground floor in a non-management sales and marketing gig, schlepping phones and service; the guy who worked his way up through a vertical maze, finding success at top executive posts in a Fortune 100 firm with 70,000 employees nationwide (about 18,500 in Georgia) and annual revenues exceeding $24 billion. Friends and colleagues say Jacobs has maneuvered his way into power without leaving bloody footprints in his path. They use words like decency and magnanimity when they talk about him, and describe him as solid and focused. He’s a typical Baby Boomer who loves the Beatles, the music of his youth, bands from the ’60s and ’70s, especially the Rolling Stones, The Who, The Grateful Dead. He’s seen them all perform, including the Dead, when Jerry Garcia was alive and picking. Every year he and Jenny shuffle to Chastain to catch the old Motown acts, and he keeps his collection current with new stuff, like Cold Play. He loves Cold Play. Jacobs is also something a movie buff. He likes films from the 1930s, the film noir stuff of the ’40s and is hooked on modern action-adventure films, like the Indiana Jones trilogy, “Back to the Future,” “Lord of the Rings.” He has a state-of-the-art home theater and owns about 400 titles. In fact, he offers to show a visitor his inventory list, the one he carries with him everywhere in his briefcase. At the office, his movie list stowed safely in the briefcase, Jacobs is responsible for overseeing all of BellSouth’s business in Georgia, a transforming telecom arena, where 65 percent of the company’s revenues come from businesses that didn’t exist when Jacobs joined the firm 32 years ago. Jacobs cut a circuitous path to his role atop Georgia ops, living or working all over the state (Athens, Augusta, Rome, Savannah) and the Southeast (Birmingham, Charlotte). But his most interesting post, both geographically and educationally, took him to Australia, where he spent almost two years as chief operating officer of Optus, a communications company partially owned by BellSouth at the time. Based in Sydney, Jacobs managed operations of a $3 billion firm that was competing against an established monopoly. In 1998, Jacobs came back to Georgia, succeeding Carl Swearingen as president of BellSouth operations in the state. The Telecommunications Act of 1996 helped encourage competition for local phone customers. Not long after Jacobs’ arrival back in Atlanta, the national economy went belly up. Facing an increasing number of rivals in the midst of a brutal economic tailspin, BellSouth was now cast in the role of the heavy. That grace and magnanimity hasn’t stopped Jacobs from actually entering the fray, though. Most recently, his big fight was in support of tort reform. As chairman of the Georgia Chamber of Commerce last year, and this year’s chairman of the Georgia Department of Economic Development’s board, he’s been one of the most influential forces in the successful effort to reform Georgia’s medical malpractice laws. He’s weighed in on other battles, criticizing state and federal telecom regulations, including the controversial Unbundled Network Element-Platform (UNE-P) rules which limited the rates the Bells could charge Competitive Local Exchange Companies (CLECs) for access to the Bells’ established networks. Last year a federal court struck down the UNE-P rules. At BellSouth, there was much rejoicing. Competition, he says, is alive and well in Georgia. BellSouth has signed agreements with 35 CLECs to provide the same access and service, but at a commercially based price rather than one dictated by the government. Cable companies, like Comcast, continue to duke it out with BellSouth over the broadband market. According to Jacobs, 93 percent of the zip codes in Georgia have at least two broadband providers and the struggle for Mr. and Ms. Consumer’s wireless soul is fierce. In Savannah alone, at last count, nine wireless network providers were competing. Every metro area in Georgia has at least six such providers. When Jacobs pauses for a moment to think of how much the industry has evolved, how far he has come, he almost staggers. He’s talking about Swainsboro here, which this year became BellSouth’s first Connected Community, a corporate project that creates a broadband telecommunications infrastructure in the hinterland comparable to any found in a major metro area. The idea is to help rural communities attract more business and industry by using cutting-edge technology as the bait. Before the terrorist attacks of Sept. 11, 2001, before the first anthrax scare scattered the offices of CBS, Jacobs presented the U.S. Congress with a frightening scenario. He was testifying before the House Subcommittee on Labor, Health and Human Services on behalf of the Centers for Disease Control (CDC). Jacobs is a major reason. In 1999 he and Kent “Oz” Nelson (retired CEO of UPS) started talking about creating a group to lobby on behalf of CDC, focused entirely on improving facilities. They called it “Friends of CDC.” Home Depot co-founder and philanthropist extraordinaire Bernie Marcus joined them. Next year Jacobs will replace Nelson as chairman of the CDC Foundation. It’s the sort of volunteer job that keeps finding him. Jacobs has been tapped to serve on or chair a dizzying array of boards. Along with the board of the Georgia Department of Economic Development, he’s chairing the Georgia Partnership for Excellence in Education. Some of Jacobs’ fondest memories of raising his three children were the times they spent reading together, and with his first grandchild on the way, the idea of storytelling and reading to tiny tots has particular appeal. But the statistics of what happens without a literate upbringing scare him. See, he’s thinking ahead. Tomorrow’s customers don’t live in Georgia yet, some of them haven’t been born. For 32 years Jacobs has been thinking ahead, trying to anticipate the next new thing. And it has served him well. What’s more, according to Jacobs’ boss, it has served BellSouth and Georgia well.